Our old friend George offered us a squash. Not just any squash. A 2 year old squash. Beautiful, blemish free, evenly colored, free from bug bites and worm holes. Hard as a rock. We brought it home, cut it open, cooked it up and spread the seeds out to dry. George has been selecting seeds for more than 2 decades. He is working towards a winter squash (which is a squash that grows all summer, has a shelf life that allows it to be saved and eaten months or years later) that produces many squash per vine and is bug and disease resistant without additional sprays, dips, sprinkles. He has been successful, this plant grows beautifully. He warns that at harvest time we must wear gloves and long sleeves, as the plants have thorns that cut right through skin. We have tended George's squash the way we do many things here: if it looks good we leave it alone. As we watched it has grown, flowered, had many bees pollinating those flowers and has set fruit. 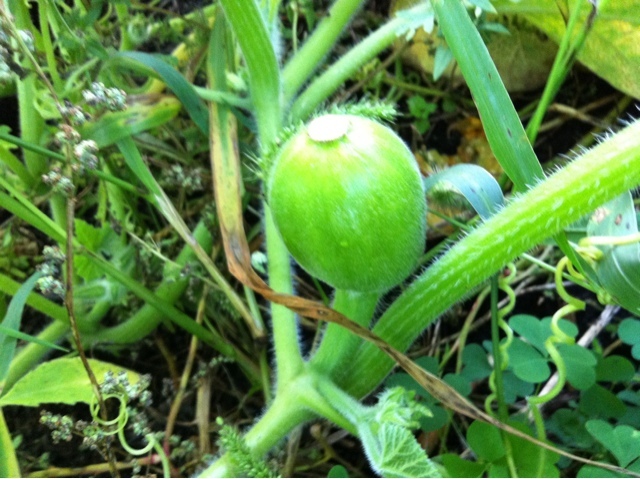 Not fruit, but little baby squash. George's squash is not strong enough to withstand cold. There are a number of plants, mostly leafy greens, that can withstand cold temperatures. Winter squash is not one of them. We are here speaking encouraging words to our little baby squash. We want to put them into our CSA boxes, hold some for winter eating, give some back to George. At the same time we watch nighttime temperatures and hope the days are warm and have some sunshine. We want these things to mature before frost kills back the plant and growth for the season is stopped. We are racing the frost to harvest.